Ok, so I realize that this may be one of the times where I just want to say, “I told you so”, but I will spare all Jets fans that embarrassment. There have been alot of negative things to report over the past two days in the NFL. Tony Romo is a fatty, Stalworth only got 30 days for killing a man, Brandon Marshall misses Jay Cutler, and of course Brett Favre is coming back a viking, but no one has really been talking about Josh Freeman. 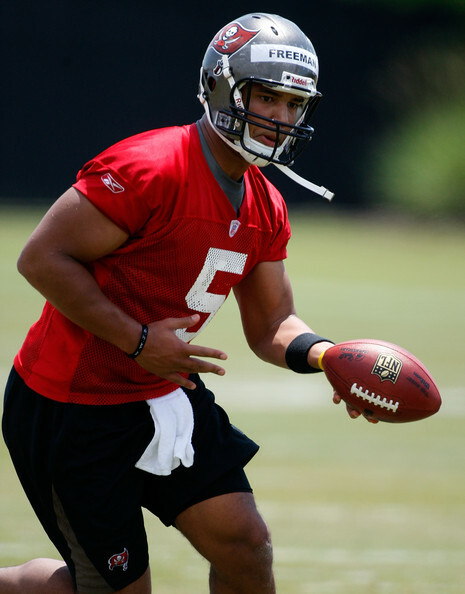 Freeman I predict will be one of the NFL’s next great black QB’s. I personally stated early this year that he was the safer pick over Sanchez, who has done really nothing to impress me or any of the coaches this pre-season. I mean really people Sanchez is a 1 year talent while freeman was a 4 year starter! Regardless Josh is forcing the Bucs make a choice, because of his superior play. When interviewed about Freeman QB Coach Greg Olsen said, “If he’s comfortable in there, he throws a great ball, he’s accurate and if he’s not turning the ball over, then gosh, maybe he will be ready to play [this year].” So I can only insist this kid has what it takes to beat out Leftwich and Mcnown!